Unfortunately I simply didn't have enough time left to make many pieces with the gorgeous beads that my swap partner, Rozantia Petkova, sent me all the way from Bulgaria (they took an unexpected month-long vacation in the postal system!). 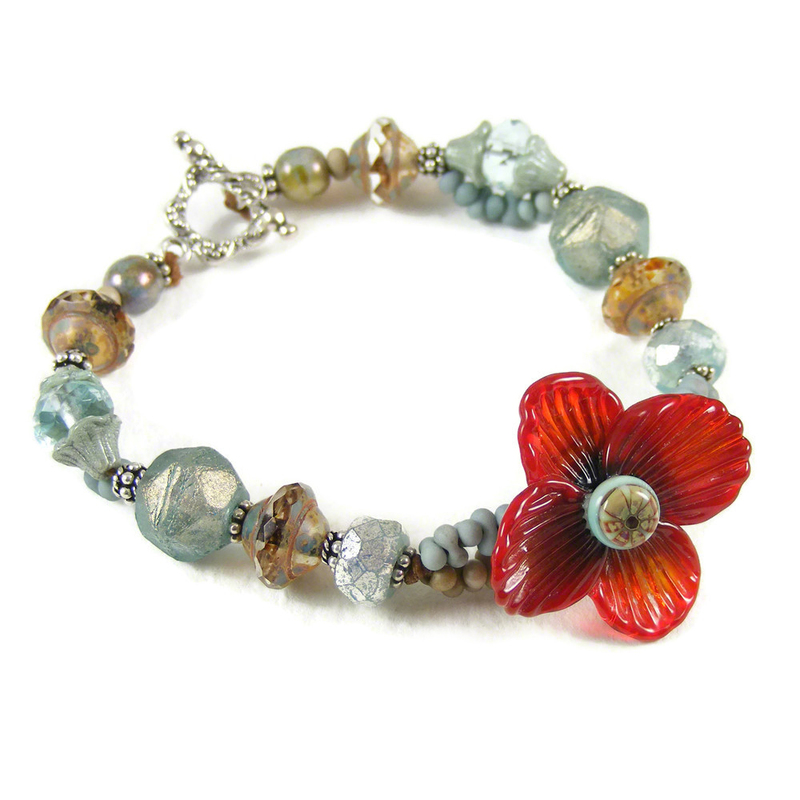 But I did manage to make a pair of earrings with the gorgeous lampwork leaf headpins, and I used one of the beautiful poppy beads as a focal in a pretty bracelet. I'm also very much looking forward to making some more pieces after Easter! The autumnal earrings above feature a beautiful pair of artisan lampwork leaf headpins and some of the Czech beads Rozantia sent me, together with my handmade sterling silver earwires and some sterling silver spacers and caps from my own stash. 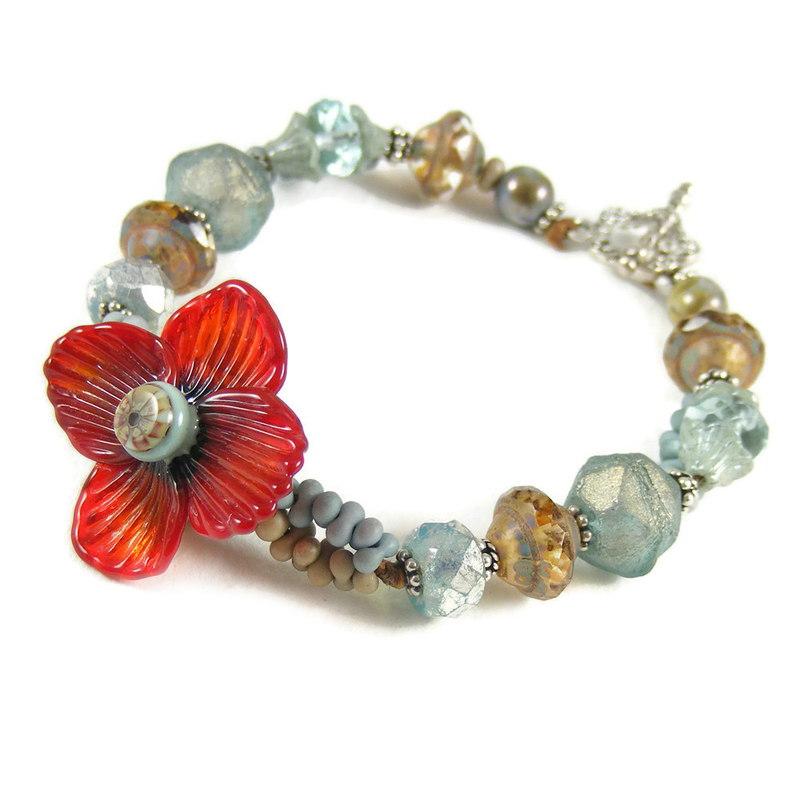 And the photos above and below show a simple, summery bracelet make with one of the fabulous artisan lampwork poppy beads I received from Rozantia. I have knotted them on waxed Irish linen cord, with a selection of sterling silver and Czech glass beads from both the swap and my own stash, and finished it with one of two lovely sterling silver clasps from Rozantia's generous hoards. You can click on this link to read Rozantia's blog post revealing what she made with the selection of beads I sent her. And please click on this link for a list of all the other participants in the Swap’n’Hop - from there you can click on the links to see what everyone made. This has been my very first Swap’n’Hop - indeed my very first bead challenge ever - and it certainly was a challenge, but not for the reasons I expected! The goodies I received were really beautiful and just the sort of thing I regularly feature in my designs, and I very much look forward to using them all! Thank you for making it so much fun, Rozantia, and a big thank you to Linda Anderson for hosting and organising it! Erika! Allow a moment for me to pick up me jaw! That bracelet is TO.DIE.FOR! If you ever feel the need...I take donations 😉😇. Holy cow that is GORGEOUS! Beautiful work! I can't wait to see what you do with the rest of your goodies!